as opposed to a normal elbow (female x female) would help this problem, but as you can see on unisonmind's cannon this is exactly what he did and it still left enough room to use 2.5" pvc as the chamber and and still have about an inch of clearance. So, onto my questions. I've never really worked with epoxy before and I'd like to know if I were to remove part of these fittings to give them a closer fit could I then seal it all together inside a block of epoxy and it could withstand at least 60-120 psi? Here's a picture I threw together to illustrate. My next question is what kind of epoxy would be best for something like this? It would require a fairly large amount (6" x 6" x 3" block = 108ci, so 108ci minus the volume of the fittings), more than comes in any of the syringe type epoxies I've seen. I've seen the sailing/boat epoxy that comes in a large metal can but I'm not exactly sure where I could buy that. Lastly, once the epoxy had cured would there be any problem sanding it down? Just to remove edges and corners and such. I know epoxy is fairly widely used in spud construction, particularly for pistons, but I'm not very familiar with its characteristics and how well it would work for things other than pistons. 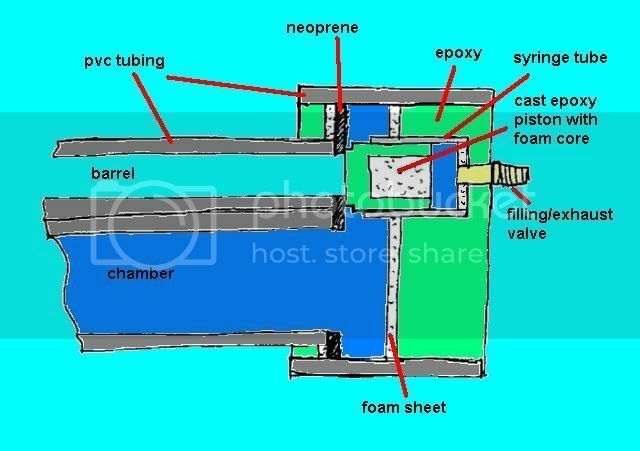 I'm almost positive I've seen a member here on spudfiles who has used this or similar methods (casting housings out of epoxy) in their cannons but I can't find anything about it now and the search function isn't much help. JSR is very well known for his epoxy casting, he makes everything from it. Patience is a virtue, get it if you can, seldom in a women, never in a man. Without doing the epoxy, get a street elbow then use 45 degree elbows to make the chamber higher like I did on Superna. One man's trash is a true Spudder's treasure! Clemsonguy he can't just use a street elbow, but I have a feeling that in combo with the street elbow he can use two 45 degree elbows to move the chamber up higher. It's OK to simply extend the chamber diameter to include the T at the chamber diameter. Put a 3inch to 2 inch reducer in each side of the T and pretend it is a 2 inch T. This provides very little airflow restriction from the chamber to the valve. This is almost as good as a coaxial like the ones I build. The 3 inch T, chamber and elbow add considerable strength to the launcher. Without the smaller parts, it is less likely to get broken. Forget the epoxy. The heaver sturdy parts will not only look better, but will improve performance. The 3 inch parts can be substituted with 4 inch for a very short compact chamber. My Marshmallow cannon does nice things with golf balls even with a very short chamber. I would actually look forward to the result of casting those parts in an epoxy block. I understand your want for an aesthetically pleasing build, and the closeness of your barrel and chamber. I too have suffered these dilemmas. I just don't have enough epoxy or patience to cast it. Use a strong two part epoxy. You want one that will cure with a good measure of impact and torsion/shear resistance. Then when you cast, make sure to rough up the outer portions of the fittings so that the epoxy might bond more securely. Then just mock up a mold and you'll be set to mix and pour. i would use two 45s to get the chamber closer along with a 90 degree elbow, I've got a launcher in the works right now, the chamber's all set up i can show a picture if you want..
That's who it was I had seen jor2daje, thanks for the link. Gun Freak wrote: Without doing the epoxy, get a street elbow then use 45 degree elbows to make the chamber higher like I did on Superna. This is actually the last upgrade I made to my most recent gun. I personally just don't like it as much this way, it still feels too bulky and it doesn't fit well in the design of the rest of the gun. Plus I ran into some troubles glueing all the joints and ended up with a chamber quite a bit off from being parallel with the barrel; that was just me being stupid though. OK. It's quick as I just used Paint at work. I miss the Gimp here.. Beef up the elbow indicated with 3 inch to the valve and beef up the valve to a 3 inch shell using a large T. Use the reducers to build the 2 inch valve inside. Flow is now unrestricted from the chamber to the valve. Now the chamber bends full size right into the piston. The elbow and T become part of the chamber. 3 inch mod. It can be done with 4 inch if desired. Have a look at this project. jackssmirkingrevenge wrote: Have a look at this project. Precisely the man I'm looking for apparently. I'm gonna go ahead and start modifying the fittings to try this I think. Did you use this stuff you linked to on ebay on that cannon? Do they make special high pressure epoxies? The only thing I've seen that's more than just a little tube is the brand x type stuff like what you linked to on ebay. How high have you taken the pressure on that cannon and what do you think it could handle? Last edited by Slauma on Tue Jun 01, 2010 8:28 pm, edited 1 time in total. Slauma if you look closely at Superna, I did screw up on the allignment of the 45* elbows resulting in the chamber and barrel not being parallel, but it is very subtle when the barrel is on. Gun Freak wrote: Slauma if you look closely at Superna, I did screw up on the allignment of the 45* elbows resulting in the chamber and barrel not being parallel, but it is very subtle when the barrel is on. Mine wasn't too bad either. Actually when I put hose clamps around the barrel and chamber for the barrel support I could tighten down the hose clamps and you couldn't even tell because it pulled the barrel and chamber together. I didn't like the idea of putting the extra stress on my PVC like that though.